Data literacy is an important part of the sciences, but it’s an important skill our students should master even if they aren’t going to grow up to work in a STEM field. In society at large, data is used to argue or persuade — to vote for political agendas, to enroll in this or that school, or to purchase one car over another. Data collection is an important part of many fields — bakers may keep logs of their recipes, gardeners track their plant growth, and homeowners keep an eye on their electrical bill month to month. People are constantly making conclusions from data, and the ability to understand how data are manipulated and presented is an important part of being an informed member of society. In the past, data literacy was presented as a part of the scientific method. (Side Note: If you haven’t yet, STOP TEACHING THE SCIENTIFIC METHOD. Check out the December 2018 workshop, “Stop Teaching The Scientific Method (And What To Do Instead)” if you still need more convincing.) “Cookie cutter” lab investigations were used to introduce the method, and oftentimes these were followed by similar cookie cutter science fair projects. As educators realized these lab investigations were doing little to help students understand and practice science as a discipline, inquiry investigations were introduced. Unfortunately, many teachers (myself included, for many years!) were not given the guidance, instruction, or tools to effectively utilize inquiry to develop science skills and understanding. 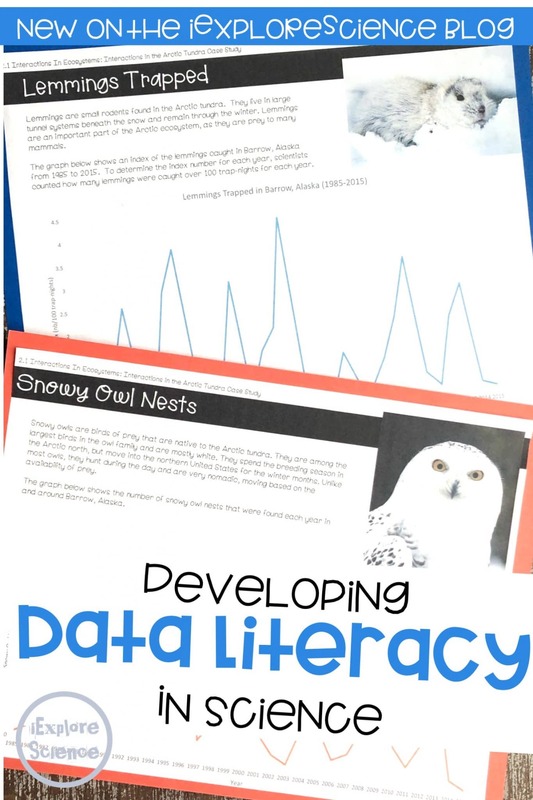 Data literacy is one tool that can help make inquiry-based learning more effective. I’ve referenced this activity again and again, but it is one of my favorite approaches to analyzing data because it’s framework can be applied to so many different situations. “What I See, What It Means” is all about helping students make observations first and then interpret those observations to make meaning from the graph, map, or table. The two step-approach guides students through the process and leads to deeper analysis. If you haven’t already, you can download this free resource by joining my email list! To scaffold the process of drawing conclusions from data, provide students with statements on sentence strips that describe patterns in the data (both accurate and inaccurate statements). Discuss which statements are accurate and which are not. Ask students to use the data to prove or disprove the statement. Ask students to graph data (allowing them to choose the type of graph they will use). Provide basic checklists so that their graphs contain key components (titles, axis labels, etc). Then, have students compare their graphs by conducting a gallery walk. Ask students to write two positive statements and one critique of each visual representation. Discuss which graph best represents the data (most accurately, most clearly) and best supports an accurate interpretation of the data. Identify which graphs present a skewed interpretation of the data and discuss how they could be improved. *This activity requires a degree of trust that may take time to develop in a classroom. Incorporating opportunities for students to give and receive constructive feedback in low-risk activities can help build this in your classroom environment. As I’ve already said, whenever you can, incorporate real-world data into your classroom. There are so many databases online today that track real-world data, there’s no reason you can’t find some to bring right into your classroom! If you are anything like me, transitioning to the NGSS can be totally overwhelming. Teaching is hard as it is – you’re busy keeping up with the “normal” lessons day to day and week to week, plus grading, meetings, IEPs, behavior management, so on and so forth. I get it. Who has the time or energy to figure out all that goes into these new standards and their impact on your curriculum, let alone what it means for your teaching! Well, I’m happy to say there IS an easier way. You don’t HAVE to muddle through everything, and you definitely don’t have to do it alone! Imagine feeling confident that the curriculum you designed is actually aligned to the standards, that your units incorporate the three dimensions and engage your students in Science and Engineering Practices that matter. Imagine classes full of students who take ownership of their learning, who thrive on “figuring it out” and “puzzling through it” and come to learn the content through discovery. Imagine days where you DON’T have to stand in front of the class, battling for their attention, delivering boring lectures and notes, printing worksheet after worksheet, and wasting tons of time on review and reteaching — only to have your students fail to perform anyway. Imagine learning that sticks, and engaging activities (that you may already be doing!) but that lead to true understanding. It’s not magic, and it doesn’t necessarily come easy, but it IS possible. Learn more at the Science Teacher Tribe Course and Community.